Many Americans swoon over Canada’s prime minister, but in Canada, his popularity is dropping. Why? Justin Trudeau is Canadian political royalty. His late father, Pierre Trudeau, was a towering figure, combative yet charismatic, who served as prime minister for nearly 16 years, from 1968 to the early ’80s. Telegenic and intellectual, the elder Trudeau was both revered and despised in Canada; conservatives saw him as arrogant and far too liberal, blaming him for tripling federal spending, running up Canada’s debt, and presiding over two major recessions. During a 1972 state dinner in Ottawa, President Richard Nixon proposed a toast to “the future prime minister of Canada, to Justin Pierre Trudeau,” who was then a baby. But as a young man, Trudeau fils seemed to have little ambition. He got a degree in literature, taught French and social studies in high schools, and acted in a TV movie. He finally turned to politics in 2008—just seven years before becoming prime minister. How did he rise so quickly? Partly on his name and partly on his inherent star quality. Trudeau first came to national prominence when he spoke at his father’s funeral in 2000, delivering a moving eulogy. His father’s Liberal Party had been adrift for years, and once he was in Parliament he was a shoo-in for party leader. In October 2015, Trudeau’s Liberals won a surprise victory over Stephen Harper’s Conservatives, who had governed for nearly 10 years. Canadians were by then thoroughly frustrated with Harper’s crotchety, standoffish persona—he hated TV and refused to participate in traditional debates. The media-savvy Trudeau, by contrast, loved to perform in public. It was a lovefest, at least at first. With his pop-idol looks, Trudeau was on every magazine cover, sometimes with his gorgeous wife, Sophie Grégoire, a former TV host. Newspapers gushed about his macho past as a snowboarding instructor, amateur boxer, and bouncer; he was photographed cuddling pandas and doing difficult yoga poses in business attire. After the honeymoon, though, Canadians expected their new leader to get on with the business of governing. 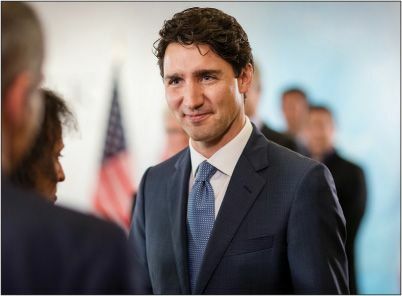 This summer, Trudeau’s appearance on the cover of U.S. magazine Rolling Stone with the tagline “Why Can’t He Be Our President?” prompted much eye-rolling north of the border. The Globe and Mail, Canada’s paper of record, instructed readers to “grab your barf bucket” before reading it. The American adulation annoyed Canadians, given Trudeau’s thin record of accomplishment after nearly two years in office. His approval rating is now about 53 percent—still solid but down 9 points from a year ago. Canadian critics say Trudeau is more interested in “virtue signaling”—using photo ops and tweets to make himself look noble—than in effective policy. When the first Syrian refugee families showed up in Canada in December 2015, for example, the newly elected Trudeau met them at the airport and personally handed out winter coats to welcome the Arab newcomers to Canada’s frigid climate. It played beautifully, making newscasts around the globe. Then, after President Trump took office on a pledge to ban Muslims, Trudeau said that Canada would welcome all refugees, of any faith, tweeting #WelcomeToCanada. But he’s had to backtrack on that open-door policy. Fearing deportation by Trump, more than 11,000 people have crossed from the U.S. into Canada on foot, including thousands of Haitians granted temporary status in the U.S. after the 2010 earthquake. So many Haitians have arrived in Quebec that they are being housed in a Montreal stadium. A tent city is rising nearby. What were his campaign promises? Trudeau promised a middle-class tax cut that would pay for itself, said he would lower the business tax rate, and vowed to lower deficits. But tax revenues have dropped by $1.2 billion a year, and the budget deficit has nearly quadrupled. (The business tax rate remains unchanged.) Trudeau failed to fulfill a pledge to reform the electoral system, in which the parliamentary candidate who gets the most votes in a district wins the seat; Trudeau said he would push for proportional representation, in which seats are allocated to parties according to the percentage of votes they won. He has abandoned that idea, saying it would create too many regional parties. As promised, Trudeau has proposed restoring the environmental regulations slashed by Harper, but for economic reasons, he’s also approved new oil pipelines, including the Keystone XL. What has he done well?